This year, get your friends and family together for a special Christmas party! Celebrate Christmas in style with our Indoor Christmas Insta-Theme. All of these Christmas themed decorations have been sorted into a category for easy shopping.Decorating for the holidays doesn't have to be stressful: in a few easy steps, you can take your walls from bland to bold with our Christmas party supplies. Start by hanging up our Wallpaper Backdrop; this special plastic backdrop creates a feeling of warmth and comfort. Use our Christmas tree decorations to liven up your walls - hang up our Christmas Tree Card Holder and let your guests fill it with their well-wishes and holiday cards. Of course, your decorations aren't complete without Santa Claus! Finish your mural with our Santa Claus decorations - our Santa Props can be taped right on to your backdrop! Make the holidays extra special with these cheap Christmas decorations! No matter what kind of Christmas scene you are trying to create we've got exactly what you need right here! Help the whole family get in the Christmas Spirit with the Indoor Christmas Insta-Theme while making decorating for this Christmas Season fun and easy. This theme is easy to use and covers an area 8 feet tall by 30 feet wide. A Christmas wall scene can be used for decorating your living room, decorating your office, or designing the stage for a play. Also, this Christmas backdrop is perfect if you are running a day care. If you and your kids are doing the Night Before Christmas play, this backdrop can instantly decorate your stage. Choose from many different props to add a more realistic Christmas feel and appearance. 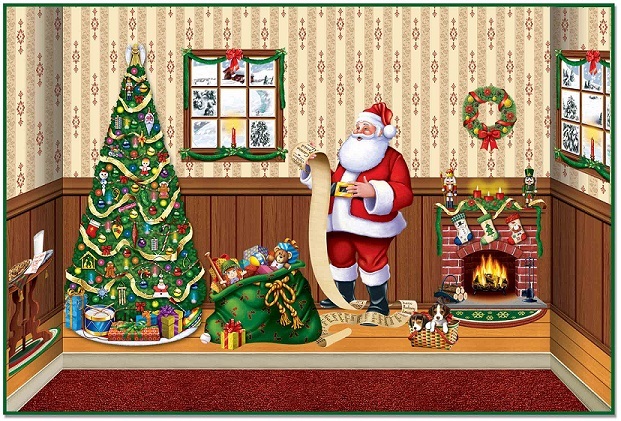 Choose to add the Santa Props which includes Santa, a bag full of toys, and a table with cookies and then the Indoor Decorating Props which includes the fireplace, windows, and a wreath. Lastly, you can place the Christmas Tree Card Holder in the scene for your Christmas tree, and Voila! You have an Indoor Christmas Scene Setter without all of the hassle and hard work. Let the fun begin! When planning a party, you want every element to be perfect for your guests to make the party feel like a getaway to your themed time or destination. A perfect way to create an atmosphere that transports guests to another world is with scene setters backdrops. Made to attach to a wall, they can make the difference between a basic party and a spectacular one! Make sure you've set the scene for fun and take your party, celebration, or event to the next level with our Insta-Themes, Scene Setters, Backdrops, and Backgrounds. Now you can transform your entire party location easily, quickly, and affordably. Insta-Themes start as a room background that you customize to fit your party theme so you can use them in the same way as a centerpiece. They help bring your theme to life! With proper care, Insta-Themes are reusable and make great everyday room decorations as well as great backgrounds for school plays or themed school dances. We offer a wide range of options for scene setters backdrops. All of the scene setters we offer feature full-color graphics of high-quality resolution. With their bold colors and vivid detail, these backdrops can transform any room into your desired destination. Use them either as a simple backdrop or add to them with our cut-outs for more of a 3-D real-life appearance. Looking to create a scene for a themed birthday party with themes such as soda pop 50’s, 60’s hippies, or circus? We have the best selection of themes to help make your next party the talk of the town. Ready to add some extra seasonal cheer to your holidays? We offer several options for Christmas scene setters perfect for creating a winter wonderland or as a backdrop for a visit from Santa. Aside from our spirited Christmas scene setters, we also offer our Insta-Themes for other holidays, including Halloween, Thanksgiving, 4th of July, and more. Set the mood with these affordable party must-haves!